There is no much time and you want to see all the best that is in the resort. In this section you will find answers to frequently asked questions and some ideas for rest in the Shymbulak mountain resort. Is Shymbulak suitable for rest with children? Yes! For sure! 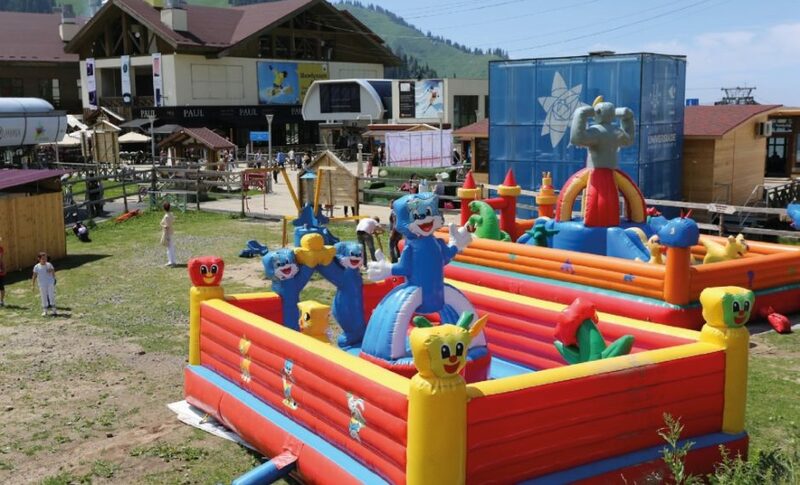 Your kids will definitely appreciate our children's playground. Here they can jump on various kinds of trampolines, ride a pony or a horse, play in the sandbox, paint with other kids, pass an obstacle course in a rope park. Older children will like to ride an electric bike or electric buggy, climb a climbing wall or do archery in a shooting room. Is there a place for walking on Shymublak (not only in the resort itself)? Oh sure! Using the Combi-2 ropeway you arrive at the highest point of the resort - Talgar Pass. Here already begins the kingdom of impregnable mountains. Leaving the ropeway you will immediately see the majestic Chkalov rocky peak (H-3892), as well as two glaciers - Til and Ayak. To the right of you there will be Shkolnik peak (H-3850), and to the left Chimbulachka peak (H-3500). Walk a little to the right - here begins the massive Bogdanovich’s glacier, 4 km length, which leads to Abay peak (H-4010), Komsomol Pass (H-4000), Karlytau peak (H-4150), Nursultan peak. (H-4376). Also an excellent and uncomplicated track - to climb the Chimbulachka peak (H-3500). The journey upward will take about an hour. From there you can enjoy a panoramic view of the city, Bashuta peak, Furmanov’s peak (H-2800), Chkalov’s peak (H-3892), Til and Ayak glaciers, the left Talgar gorge, and in good weather Bogdanovich glacier, Komsomol (N-4000) ) and Abai peaks (H-4010) and Nursultan (H-4376). From the Shymbulak Base Station (H-2200) you can walk along the earth road to the Memorial to the Dead Mountaineers, then to the Mynzhylki Dam and up to the mountains, down to the T1glaciological station (H-3400). Do not forget about suitable tourist shoes, trekking sticks, sunscreen, sunglasses and headwear, as well as supply of water and provisions. It is strongly advised to use the services of qualified guides that will make your walking tour interesting and safe. You can pay for the guide's services at the Information center at Shymbulak base station. Where is the best view of the city and the mountains? The main observation platform is located on the Talgar Pass (N-3200) (Combi-2 ropeway) in the Panorama Cafe, the terrace of which is an observation platform and is equipped with powerful binoculars that will allow you to admire both the city and the mountains. Where are the lifts by which you can get to the track to the observation platform? 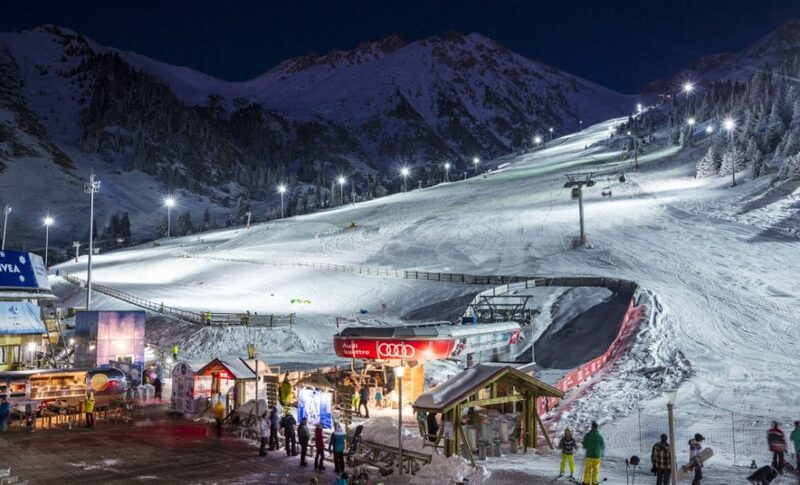 The first stage of the ropeway starts a little before the Medeu rink at an altitude of 1,700 meters above sea level. It will take you to the base station of the Shymbulak mountain resort (N-2200m). Leaving the booth, in front of you there you will immediately see the second section of the ropeway - Combi-1. It leads to the Shymbulak Central Station (H-2800). At this station there is S.N.e.G. hotel-restaurant. Leaving the ropeway, turn right and you will see the 3rd section of the ropeway, Combi-2, which will take you to the highest point of the Shymbulak resort - Talgar Pass (H-3200). Here you will find Bar 3200 and Panorama high-altitude cafe with a viewing platform. 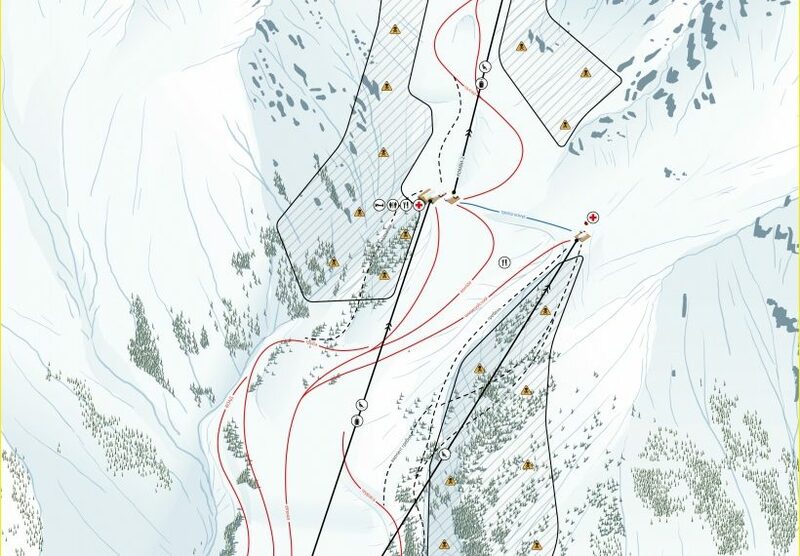 Map of the slopes can be viewed by clicking on the picture. I plan to spend one day in Shymbulak. What can I do? 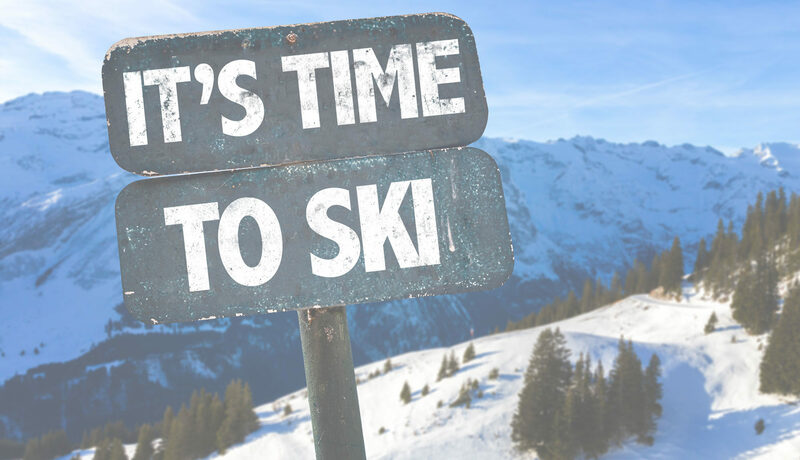 In the winter season it makes sense to spend a day skiing or snowboarding. Skating is possible from November to April, in the summer the heliskiing groups continue to operate. 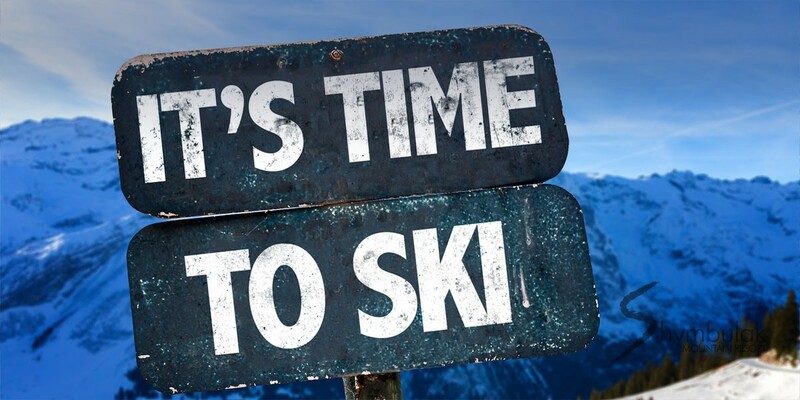 Those who do not ski can climb up to the observation platforms, where a magnificent panorama of the mountains opens. 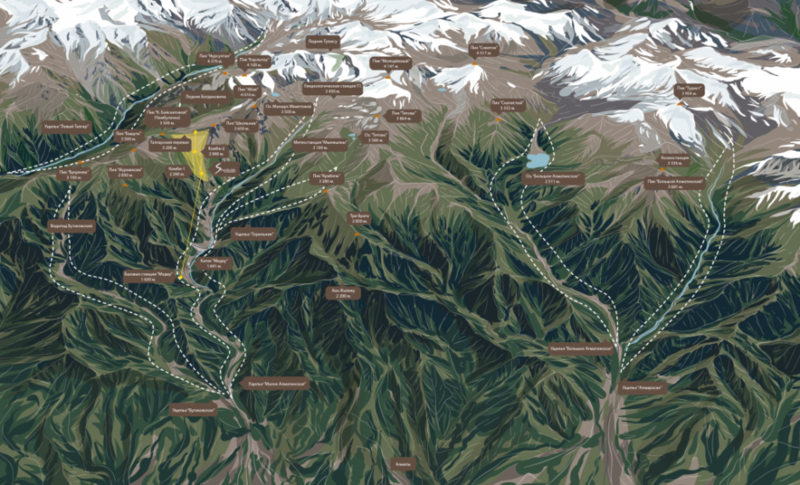 Each upper station of the lift has good restaurants and cafes, where you can have lunch or just have a snack. Returning to the base station it is worth visiting local shops and cafes. Among the most interesting excursions to Shymbulak - extreme buggies trips and paragliding - from the air Shymbulak looks even better. I will have only two hours on Shymbulak. What can I see? If you are limited in time, we advise you to climb to the upper point of Shymbulak - Talgar Pass (N-3200m) on the gondola road and admire the landscape views. The one-way road from the Shymbulak Base Station (H-2200) will take you about 20 minutes. 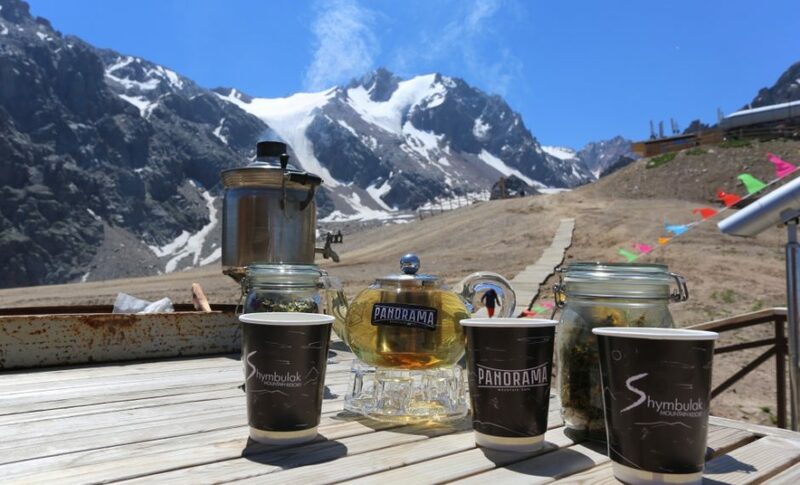 Here you can walk, drink coffee and have a snack at the Panorama Cafe, the terrace of which is an observation platform and is equipped with powerful binoculars that will allow you to admire both the city and the mountains. 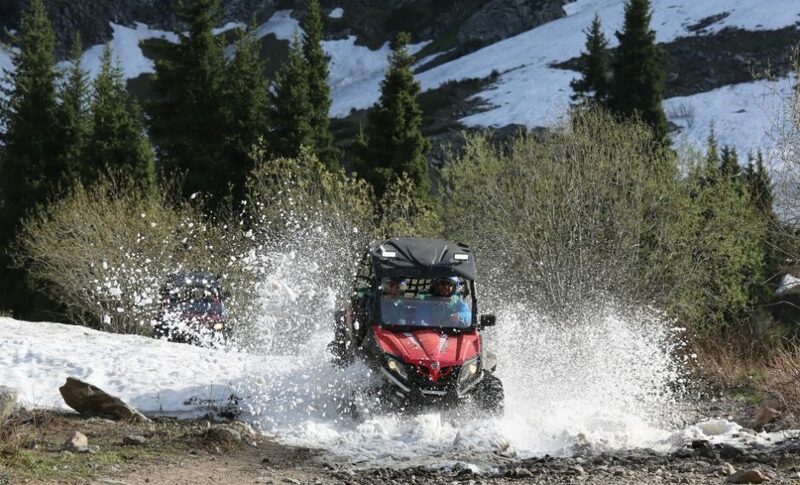 Another option (summer): ride high in the mountains on a special car - buggies. You can choose different routes lasting from 1 hour. Experienced instructors will accompany you during the trip and tell you about the surroundings. You can rent a buggy by contacting the Shymbulak information center. Do not forget to visit the ChimbaShop souvenir shop, which is located on the mountain resort Shymbulak opposite the Information Center. From which point of Shymbulak it is possible take the most beautiful photos? What can you see in Shymbulak? Shymbulak is one of the most beautiful and interesting resorts in Kazakhstan. 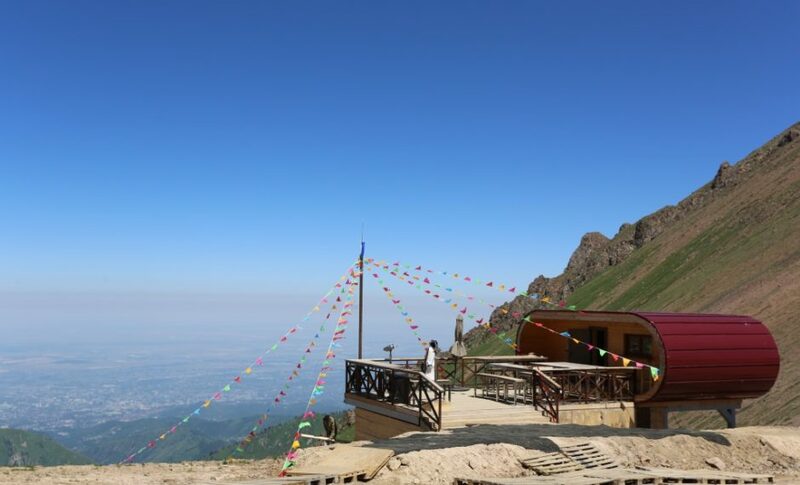 We suggest you to visit the most interesting places in the picturesque gorge and around it, as well as visit the best viewing platforms, from where the best pictures are those of the nearby peaks and the pearl of Kazakhstan - the city of Almaty.